You are a noble builder settling the country in Milestones! Players work together to build roads, create marketplaces and erect houses. With each milestone set along the way, they move further into the country. However, while building the country together, in procuring building materials, money and grain, each builder is on their own! Thus, you must carefully develop your own network of goods, trade and colonization materials, and optimize cleverly. The noble builder who grabs the most valuable building sites will surely win the game! With a fresh circuit mechanic, Milestones requires timing and pacing: Build at the right moment without going too fast, produce the right goods without moving too slowly. 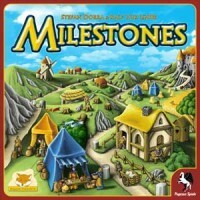 Add a Review for "Milestones"